I wrote this in an email to a lawyer friend about my frustrations with my recent jury duty. Thought it’d make a good post. Please comment! Girl testifies that she goes running out of a club in the Tenderloin in the middle of the night- fight with estranged husband that she ran into at 818 Eddy, gets in her car, smashed, and knocks into a couple of cars, grinding gears, drives down the street, and her friend flags her down telling her she’s too drunk to get on the freeway and go home. He drives the car to a parking lot (there is proof of him driving to the parking lot), followed by a cop. The cop arrests him in the parking lot for drunken driving. The jury felt that he had no other choice to get her out of the car and for her not to drive on the fwy. The DA argued that he could have flagged the car down, and then NOT gotten in the driver’s seat, but get another friend/cop/let it get towed. The thing for me is that the DA easily proved on both counts- being influenced by alcohol and having a .08 or higher blood alcohol. level. The defense, though, just told a story that the jury ate up. He didn’t prove the 6 points of the necessity to a “preponderance”. In fact, the jury didn’t even understand that there were two counts or that we had to go through the 6 points. It was purely a “we want to be merciful” and anti-cop kind of jury. All women, 2 guys. One of the guys was with me, as to “we don’t believe this defendant” and “it’s all an (unproven) story.” I swear, all the defense attorney had to say was “chivalry” and “good Samaritan” and the jury was his. This is the second jury I’ve been on (of 3, recently) where the jury really didn’t pay attention, couldn’t list the evidence, didn’t understand the judge’s instructions, and couldn’t for the life of them separate their personal experiences with the facts of the case. The cops were young, and got this guy in (supposedly) 1 block of driving, so the jury thought they were being opportunistic. There were 3 cops, though, and 2 corroborated their story pretty well, so I admitted the testimony. The forewoman was hilariously bad. She kept going to her own personal stories, had a very strong opinion, put people on the spot, was factually wrong about process, and all of this because “my husband is a lawyer.” This little nugget stuck with me: “DUI convictions don’t work- I have several friends who have them and their behavior doesn’t change,” and “the judge saw fit to try this so he’s sympathetic.” I argued that we can’t say the fact that he’s in court is a part of the trial- it’s not a fact of the case, and that was a good 15 minute argument, with the forewoman. She was such a bad facilitator. She didn’t ask half of the jury what they thought, didn’t review the evidence, and constantly cut people off. If I get on jury again I’m going to be the foreperson. I ended up getting one juror to argue a logical explanation of their point of view. The other naysayer decided to go along with the majority since he hated being called into jury duty during Christmas (!). So we acquitted the defendant, on the grounds that we didn’t feel that “a reasonable person” in the same drunken state, would have done anything different than wrest the driving wheel from the hands of the drunker person and try to park it legally. I agreed- but speaking of wresting, I had to wrest the process from the argumentative, annoying forewoman. Interesting sidenote: the parking laws of SF have citizens a lot more scared than a potential manslaughter. City Tow has inspired serious fear in the hearts of your random 12 people. After the passage of a few days, I have to say that in a way things do equal out. If juries think it’s unimportant, they tend to be swayed on whatever story is more entertaining or emotional. Is that bad or unethical? Not really- in the two cases I’ve been on where the juries didn’t pay attention, they did that because they didn’t think it was important. In the homicide case, the jury was very attentive, and took the proceedings a lot more seriously. So despite lawyers & defendants wanting to sue people and have “their day in court,” the jury gets worse and worse the more irrelevant the case, which does kind of balance out. Written Saturday, December 27th, 2008 in local color. You can leave a response, or trackback from your own site. I've never been a fan of jury trials, simply because of this kind of behaviour. You'll always find that twelve random people don't have the experience and knowledge of law that you'd get in one legal professional (or gifted amateur). Perhaps back when the US was founded, it was more likely that people would have a better understanding of the legal process, at the very least, but that still strikes me as too optimistic. I'm not saying that judge trials are the only way to go; sometimes things are better left to a committee (and that's just what a jury is) but 99 times out of 100, you'll wind up with idiots deciding on a person's future, and that's no good. That sounds like a crazy story. What a horrible foreperson! But what's the photo of last year's NYE party? 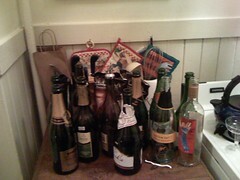 ;) Is it because we drank 12 bottles of champagne and those empty bottles are like the jury? haha. I was trying to pull in the “living in SF” (the background of the photo) the sheer amount of drinking we did- 12 or so champagne bottles- and how as city residents we are wise, oh so wise, to taking cabs and busses instead of getting behind steering wheels, like those bridge & tunnelers. As frustrating and backwards as it may seem, what your describing is, to my understanding, part of the way that a jury is supposed to work. Many people don't realize that a jury is entitled to interpret the law. That the jury does not understand legal processes and involves their own personal views allows for a more flexible legal system, overall. Sometimes it can make the system a little too flexible but, usually, a judge can reign in a jury sufficiently to prevent things from deviating excessively from the law. Perhaps the result wasn't what it should have been or, perhaps, it is for the common good to encourage people to take cars away from drunk drivers and park them, even if they, themselves are inebriated. I agree- it was a good call overall. The process, though, was very f-ed up, and yet, as I say near the end, the lack of energy and attention was mostly because the cops were overzealous (&DA) and so what you get is what you get. Know what I mean? I don't know, Chris. I am a big fan of jury trials. The ordinary citizen acts as the last check and balance on the government's overzealous enofrcement of the law; or, just the government's enforcement of bad laws. With the exception of the part about the foreperson being a bad facilitator, it sounds like things went about how they should have. If all the accused did was to get in the car and drive it a block in order to park it, what is the problem? It may have been a different outcome if the accused had driven the woman all the way home. Who knows? But, as for the idea that judges should decide people's fate, that is not a good solution. They are not necessarily any smarter than the average person. They are not any better at determining credibility than the average person. They are more likely to favor the prosecution and its witnesses. And, as for the average person who lived when thecountry was founded, I am not sure why that person would have had a better concept of the legal proces, but I am sure that the process has changed considerably since the 1600's. All in all, I think it is the best system in the world if you have the right lawyer. And, apparently, this particular accused did. The prosecutor should have foreseen this story being told and fashioneda better story that accounted for the defense's version of the facts. i agree with you on this completely.visited your blog first time today.but will surely come again.